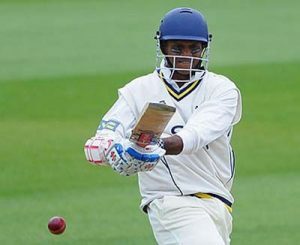 London, CMC – Veteran former West Indies left-hander Shiv Chanderpaul missed out on the opportunity to extend his heavy scoring when rain forced the abandonment of the final day of Lancashire’s clash with Warwickshire yesterday. Set to resume unbeaten on 24 with the visitors on 178 for four, Chanderpaul was frustrated as all-day rain in Birmingham kept players off the field at Edgbaston before the day/night encounter was called off at 4 pm. It meant the 42-year-old Guyanese ended the match without being dismissed, following his excellent unbeaten 117 in Lancashire’s first inings of 273. Batting under lights, Chanderpaul faced 151 balls in a shade over four hours and struck 16 fours, to notch his third hundred of the County season and the 76th of his remarkable first class career. He has gathered 559 runs so far in the campaign at an average of nearly 80. Chanderpaul, who played the last of his record 164 Tests two years ago, was also among the leading run-getters in the West Indies first class championship this year. At Hove, Barbadian seamers Jofra Archer and Chris Jordan both took a brace of wickets as Sussex’s contest with Gloucestershire ended in a draw. Following the visitors’ declaration at their overnight 150 for one in response to Sussex’s 358, the home side rattled up 142 for one declared in their second innings. Bermudian opener Delray Rawlins struck a swift 24 from 15 balls with six fours while partner Harry Finch ended unbeaten on 74 off 59 balls. Set 351 for victory, Gloucestershire were tottering on 117 for six before recovering to finish on 212 without further loss. Jack Taylor struck an unbeaten 69 to prop up the innings in a 95-run stand with Kieran Noema-Barnett (37 not out). The brilliant Archer (2-32), in his first full season of County cricket, took of the first four wickets to fall as Gloucestershire slumped to 46 for four. Jordan (2-47) then followed up with key strikes to seriously hurt the innings. There was no play on Tuesday’s second day due to rain.